16 OSHA colors to choose from: yellow, white, black, red, orange clear, light green, kelly green, dark emerald green, dark blue medium blue, shy blue, dark brown, medium brown, gray and purple. 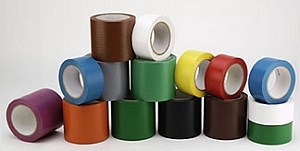 Our vinyl tapes are a thick 6 mil with an aggressive synthetic rubber adhesive. Ideal as a lane marking tape. Vinyl tapes are great detailing tapes. We can slit to as narrow as 1/4"
All our vinyl aisle marking and detail tapes are slit to order. Allow 3 days for slitting.